Such a gorgeous card Kerri. I love it Kerri! Love all the colors you used. Kerri, this is so adorable. Wonderful layout and I love your coloring!!!! This is super adorable!! I love, love, love that snowflake and your coloring is just perfect, tfs!!! Oh my word Kerri this is SOOOOO CUTE!! LOVE the colors, your coloring, and that gorgeous snowflake!!! CUTE CUTE CUTE GF! Awww I just want to grab little Ellie and hug her! LOL This is adorable Kerri! Perfect layout and that snowflake is yummy! I hope you survived the doctors today! ACK! OMG Kerri! She is SUPER cute! LOOOOOOVE the layout and papers too! Your coloring ROCKS! Aw!! This is just the sweetest Kerri!! I so love your coloring and your super layout!! That snowflake is such a gorgeous touch!! OMG Kerri!! She is sooo fun and adorable!! This card made me smile! Oh she's a cutie! 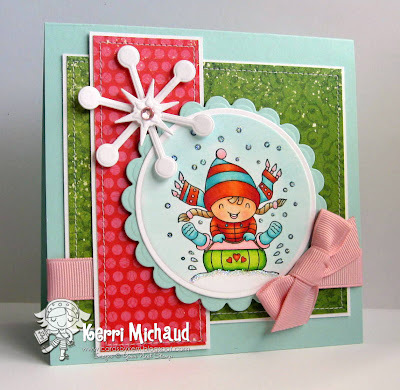 This is a really fun card with all the fun colors and the cute lil' image; that snowflake is really neat too. Oh my....this is just so stinkin' cute!! Love this image but I think you made it come to life and brought a lot of FUN to it with your colors and layout design. Awesome job as always!! LOVE IT!! ADORABLE!!! What a cutie and so fun with those colors! Absolutely adorable! Love, love this stamp!